Navigating the inner realms and relationships. New York Times Best selling author of Women’s Bodies, Women’s Wisdom; The Wisdom of Menopause; Mother Daughter Wisdom. Noted visionary, speaker and television personality. The Unmistakable Touch of Grace. Life coach, presenter, producer and broadcaster. 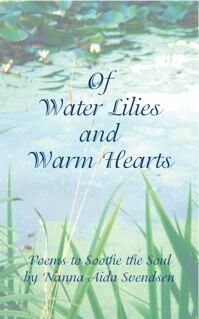 OF WATER LILIES AND WARM HEARTS A book of poems with the simplicity and yet depth of a great haiku. Svendsen has really thought about the essence of things, the emotional machinery of living, and there is something really appealing about her crisp and almost visionary observations. She shifts the shadows to show light, shifts the light to show shadows. There is no cleverness, no word-magic, just the offering of some cold and warming eternal truths.